Recently, we added a new food to the floofs’ meal rotation, and it’s been a huge hit. 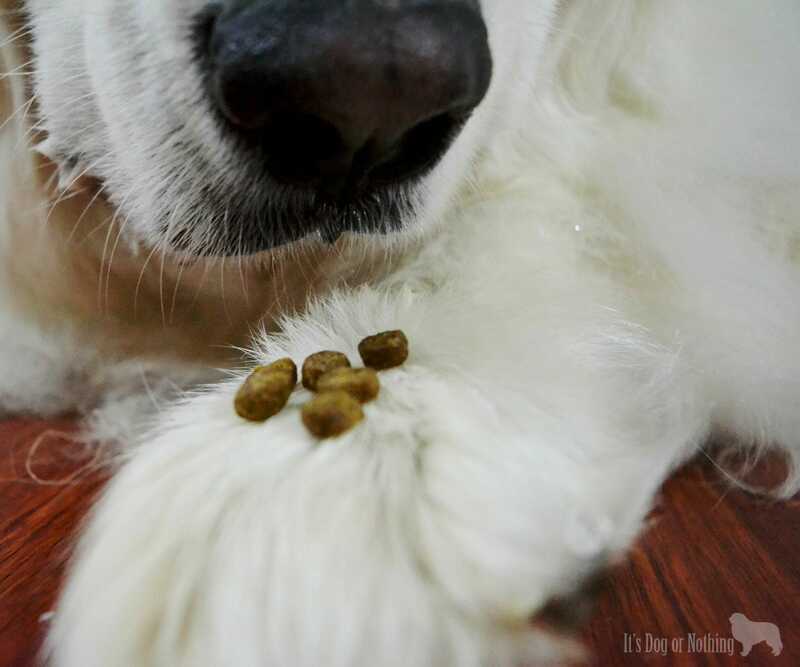 If you have a Great Pyrenees, I’m sure you know the pain of trying to keep your dog interested in their food. We have a few standard go-tos that the floofs will eat consistenty, and I’m thrilled to add Dr. Marty Nature’s Blend to the list. To deliver high-level nutrition to your pets in the most delicious way possible. Together, they created several products for dogs and cats—full of nutrients and great flavor—that leave your pets begging for more. All Dr. Marty ingredients are ethically sourced and of the highest grade. For four decades, Dr. Martin Goldstein has been a leading voice in the veterinary community. He earned his Doctor of Veterinary Medicine from Cornell University, specializing in integrative canine medicine to help prevent and treat many diseases. Many experts–—and thousands of satisfied clients—consider him to be America’s foremost integrative veterinarian. Dr. Marty knows what your dog needs to stay its healthiest—and creates products to help. Nature’s Blend, Dr. Marty’s Premium Freeze-Dried Dog Food, is a nutrition-packed formula designed to give your dog a healthier, happier life. 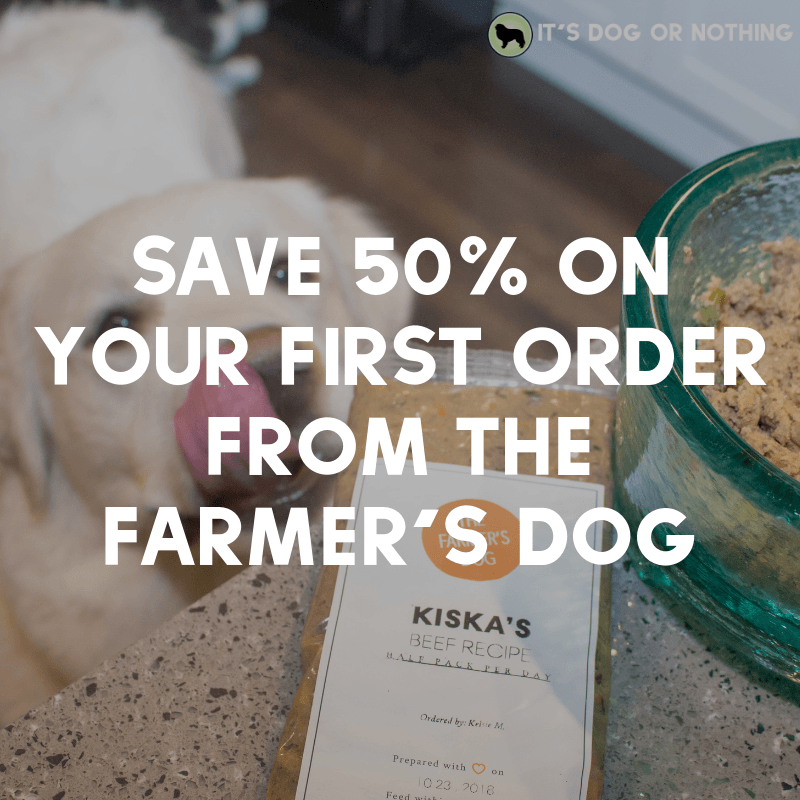 We blend a variety of meats, fish, ranch-raised beef and duck, and other protein sources with fruits and vegetables for the balanced, complete nutrition your dog needs. We receive all our ingredients fresh, then gently freeze dry them so they’re bursting with flavor and nutrition. I can think a food is great, but if Mauja, Atka, and Kiska won’t eat it, it’s pointless. I always try to refrain from getting too excited about a food until the floofs give it a taste test (and eat it for more than two days in a row). When I make their food, I always add a little extra water and let it sit for a few minutes longer, turning the water into a nice “broth” for them. They love it and think it’s an added treat! It also enhances the flavor of dry food nicely. Nature’s Blend is a HUGE hit for my three. I was worried because Kiska can be sensitive to turkey, but she’s been eating the food without an issue for a few months now. I think the blend of protein sources makes all the difference. If you have a picky eater and are worried about spending the money, only to have your dog not eat it, don’t worry. Dr. Marty offers a 90-day money back guarantee—no questions asked. Dr. Marty also has a few supplements that I’m interested in testing. First is a digestive supplement called ProPower Plus. All three have always had sensitive stomachs, and I’ve been looking for a good digestive supplement for her. The other supplement we’re interested in trying is a joint supplement called Free & Active. Having giant breeds, I’m always concerned about joint issues, and start all my dogs on a joint supplement immediately. Since Mauja has had TPLO surgery and showed mild arthritis in her other knee, keeping her joints healthy is extremely important to me. Have cats? No problem. Dr. Marty also has a freeze-dried cat food called Nature’s Feast. I’ve been so thrilled with the dog food, that I’m thinking of trying this for Indie. Stay tuned to hear more about Dr. Marty. They support Freedom Service Dogs of America, an organization that trains rescue pups to be service dogs. If you’ve been around awhile, you know Kiska was a rescue and is now my service dog in training. I can’t wait to tell you more about this amazing partnership! In the meantime, treat your pup and give Nature’s Blend a try. I have a feeling you’ll want to add it to your normal food rotation. We have a special offer for new customers! Try Nature’s Blend today! Your dog will thank you. We’re officially halfway through our 12 Days of Giveaways! We’ve had a blast so far, and I hope you’ve enjoyed seeing all of the amazing products. If you missed a day, be sure to go back and enter the giveaways here. Today, we’re hosting a giveaway for a new floof favorite, and I guarantee your dog will love it. We’re going to give you a brief overview, but stay tuned—we’ll be talking more about this product over the next few months (that’s how much we like it). A leader in integrative medicine, Dr. Martin Goldstein (Dr. Marty), aims to combine both traditional medicine and alternative therapies to help your pet, be its healthiest, happiest self. After going through his own health issues and learning how to heal them, he knew he could make the lives better of our furry friends. A few months ago, we were given the opportunity to try the dog food from Dr. Marty, Nature’s Blend. I was a bit apprehensive about trying it because the floofs are insanely picky, but I figured we’d give it a try—never hurts to try. Nature’s Blend is a premium freeze-dried dog food formulated to give your dog a healthier life. It combines proteins (including meats, fish, beef, and duck) for variation, and includes fruits and vegetables for balanced nutrition. It is also all-natural and free from chemicals and fillers. My favorite thing about Dr. Marty’s is the fact that they partner with Freedom Service Dogs of America. Freedom Service Dogs of America rescues shelter dogs and trains them as service dogs for the people who need them most. This is a cause close to my heart since Miss Kiska was a rescue and is well on her way to become a service dog for me. We have so much more to tell you about Dr. Marty and his products, so keep your eye out over the next several months. In the meantime, enter below to win two (2) bags of Nature’s Blend from Dr. Marty! Five (5) lucky winners will be randomly selected. If you just can’t wait to get your paws on Dr. Marty’s food, you can try some at a GREAT discount. Click here to give it a try! Did you miss any of the other giveaways? Find them all here! If you’ve been following us for awhile, you know that Mauja and Atka are picky, picky, picky. I have to constantly change their food or mix up their meals somehow. I have a hard enough time getting weight on them as it is! Only Natural Pet is always my go-to for the fluffies’ food. Their food is not only high-quality but affordable as well. The variety of recipes makes it easy to do a rotation diet. So, obviously, I was beyond thrilled to receive the opportunity to try Only Natural Pet’s Wholesome Homemade dehydrated dog food. It’s perfect to mix up their meals or as a stand-alone meal. Wholesome Homemade is an easy way to prepare a fresh, healthy meal for your dogs. I don’t know what your schedule looks like, but I’m pretty sure it’s as insane as mine. Between a two-hour work commute and other obligations, I’m often tapped out. Chopping up veggies is the last thing I want to do in with the few minutes I have to myself. The last point is one of my favorites about Only Natural Pet’s Wholesome Homemade – they have multiple recipes. Currently, you can choose from the poultry recipe, the red meat recipe, and the fish and fowl recipe. This makes it super easy to keep them interested in their food! Currently, the red meat feast is their favorite. Although, the fish and foul recipe is a close second. The first time I made the food, it was a bit “soupy”. The fluffies aren’t a big fan of overly liquid food, so the next time I just used slightly less water. I think if you prepare the food and let it soak overnight, you wouldn’t have that issue. I’m not going to lie – I was pretty impressed with the Lamb Log. I’m really picky in the chews I give Mauja and Atka with all the horror stories you hear today. The chews didn’t break or splinter, and they lasted a surprisingly long time. We were also able to try the Lamb Trachea which was a pyrfect starter chew for little Miss Kiska. It lasted hours for her, but Mauja and Atka devoured them in about five minutes. I always forget how long chews last for puppies and small dogs! Want to try some Only Natural Pet food and chews? Enter below for a $50 gift card to Only Natural Pet! * Disclaimer: We were compensated to review the product mentioned above, however, we only share products we use and truly believe in. An advertiser will never impact the content of this site. If you’ve been following the fluffies for awhile, you know that we love all things Wellness Pet Food. We’ve talked about almost every one of their formulas on the blog and have yet to be disappointed. Our favorite is the Wellness® CORE® line and it’s a staple in Mauja and Atka’s rotation diet for years. I usually to try and add a topper to their dinner, whether it’s wet food or something freeze-dried. Much to the fluffies’ dismay, I sometimes forget to add something to their dinner, so they were beyond thrilled when Wellness started offering their new line to make it easier for me: Wellness® CORE® RevRaw. This post is sponsored by Wellness® and the BlogPaws® Pet Influencer Network. I am being compensated to help share information about the Wellness® CORE® RawRev raw food dog food but It’s Dog or Nothing only shares information we feel is relevant to our readers. Neither Wellness or PetSmart are responsible for the content of this article. Wellness CORE RevRaw contains high-quality, grain-free kibble with freeze dried raw pieces as an added nutritional boost. These 100% meat bits create a savory, nutrient-rich meal packed with everything your dog needs to thrive. They are less processed and able to remain in their raw state because only the water is removed. Not to mention, it encourages my picky eaters to actually finish a meal. If you’ve contemplated “testing the water” with raw food, Wellness CORE RevRaw offers a safe and convenient way to try it out. The high protein ingredients encourage lean body mass and muscle tone to help your dog live a long and healthy life. Not only that, but it includes glucosamine and chondroitin to support strong joints as your dog ages. I also love that there are multiple flavors to satisfy every dog. Their original recipe offers a turkey formula (which is what Mauja and Atka are trying) and a lamb formula. There is also a turkey recipe specifically designed for small breed dogs. Love Wellness Pet Food and want to keep up to date on the current happenings? Follow them on Instagram, Twitter, Facebook, and Pinterest. Can’t wait for your dog to get his paws on Wellness CORE RevRaw? There’s a great offer happening: Buy One, Get One 50% off by visiting PetSmart and Unleashing the Power of Raw. This post is sponsored by Wellness and the BlogPaws Pet Influencer Network. I am being compensated to help share the availability of Wellness Products at PetSmart, but we only share information we feel is relevant to our readers. Neither Wellness nor PetSmart is responsible for the content of this article. While I feed “all life stages” food sometimes, my preference is usually to feed a formula targeted at large breed dogs. I prefer large breed formulas, especially in busy times, because I don’t have to worry that Mauja and Atka are getting enough nutrients. Specifically, I’m concerned that they are getting the necessary amounts of omegas, glucosamine, and chondroitin. While these nutrients are good for any dog to have, they are especially important for giant breed dogs to maintain healthy skin, coat, hips, and joints. When feeding an “all life stages” food, I supplement the fluffies’ diet with salmon oil and a hip and joint supplement. This provides me with added comfort, but it’s also additional products I have to buy and ensure I have on hand. A quality large breed formula decreases the need for additional supplements and adds simplicity to my busy life. Thankfully, Wellness® offers several large breed formulas, including one of our absolute favorites. At Wellness, we do whatever it takes to create the healthiest foods for the pets that depend on us. Food feeds their souls, sustains their lives, and protects their bodies. That’s why our diverse team of animal lovers, nutritionists, and vets has only one mission: To help you provide your pet a healthy, happy, long life through the power of natural nutrition. The Wellness Difference is about being more than natural. And it’s not about what is left out = no fillers or artificial ingredients – these are a given for us. True Wellness is about what we put in – a small number of simple, pure, authentic ingredients. We believe this is the way to make superior food for our animals. Atka trying to decide which Wellness product he wants at PetSmart this time! The focus on ingredients that are included, rather than ingredients left out, is one of my favorite things about Wellness. They’re not focused on simply leaving out unhealthy ingredients. Wellness wants to include the best ingredients to provide high-quality nutrition for your dog. More importantly, you don’t have to worry about Wellness simply adding the latest buzzword to their label. There are a few distinct differences between the regular CORE line and the large breed CORE formula. In my opinion, the most important difference is the level of glucosamine and chondroitin. While the original CORE formula contains 250 mg/kg of glucosamine and 200 mg/kg of chondroitin, CORE large breed boasts 750 mg/kg of glucosamine and 250 mg/kg of chondroitin. The higher levels will help to keep your giant breed’s hips and joints healthy for life. Feeding a large breed formula isn’t a must for your giant breed, but it definitely makes life simpler by including the necessary supplements in the food. Regardless of the CORE formula you choose, you’ll be giving your dog a high-quality, high-protein food filled with all the nutrients your dog needs to thrive. Be sure to stop by your local PetSmart and check out the extensive line of Wellness CORE and Wellness® Complete Health products! You can follow Wellness on Facebook, Twitter, and Instagram and PetSmart on Facebook, Twitter, and Instagram as well. If you have a giant breed dog, have you tried the Wellness CORE Large Breed formula? What’s your dog’s favorite Wellness product? I have Celiac disease. If you’re not familiar with Celiac, I’m certain you’re familiar with the gluten-free trend. For people with Celiac disease and Non-Celiac Gluten Sensitivity (NCGS), a gluten-free lifestyle isn’t a choice, it’s a necessity. Recently, I was out with Atka browsing the pet food aisle. I’m not sure why (maybe I’m a tad weird), but I enjoy looking at all of the available commercial foods, studying the ingredients, and then pulling out my phone to continue the research. Plus, it gives me ample time to work on down-stays with Atka. This post is sponsored by Wellness® Natural Pet Food and the BlogPaws® Pet Influencer Network. I am being compensated to help share Wellness Grain Free options, but we only share information we feel is relevant to our readers. Wellness is not responsible for the content of this article. I didn’t know what to say. 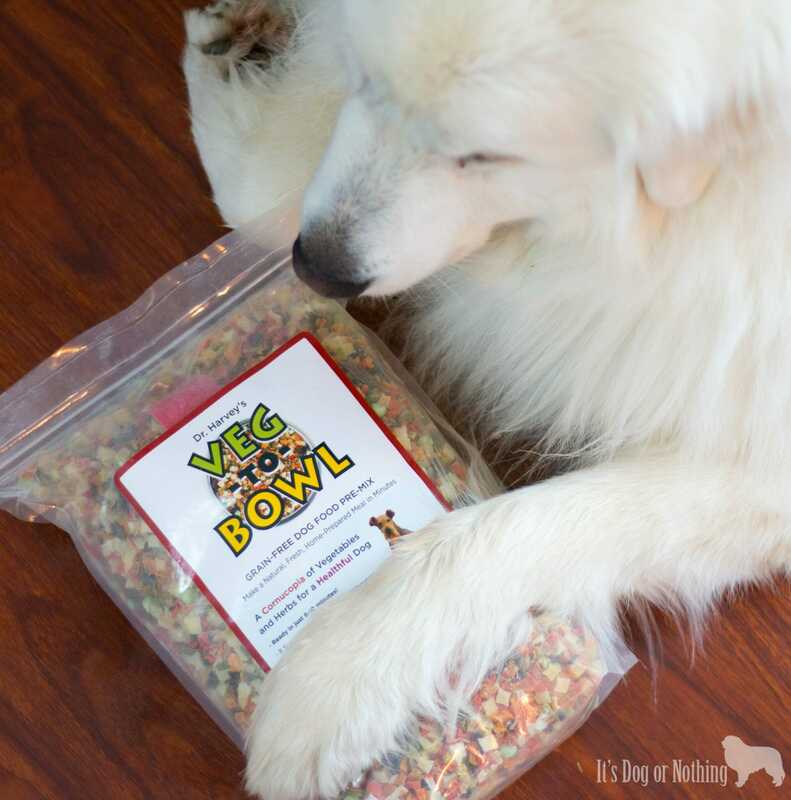 Yes, Mauja and Atka consume a grain-free diet of commercial pet food and homemade food. While they have not always been on a grain-free diet, their switch happened before my diagnosis, when they reached adulthood. Unfortunately, when this individual commented about my feeding practices, I was so caught off-guard that I didn’t know how to answer. 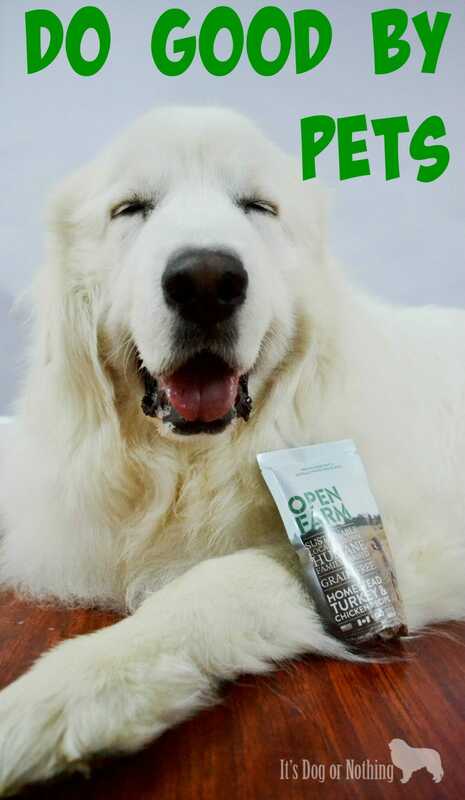 Now that I’ve composed myself, here are my top 3 reasons for feeding my Great Pyrenees Wellness Complete Health grain-free food. Grain-free food provides more of a nutritional punch. Rather than being full of empty calories and nutrients, they get “more of the good stuff”, such as chickpeas, flaxseed, carrots, sweet potatoes, spinach, apples, and blueberries. In Wellness dog food, this includes natural ingredients with high-quality protein for full energy, prebiotics and probiotics to support healthy digestion, and vitamins A & E to support healthy immune system. Grain-free food can help alleviate allergies. Great Pyrenees are prone to both food and environmental allergies, so I wanted to be cognizant of that fact when determining their diet. Grains are a popular allergen trigger for this breed. Grain-free diets can help prevent ear infections, stomach upset, and other gastrointestinal issues. If Mauja and Atka are comfortable and happy, I’m happy too. As completely shocked as I am to say this, Atka’s itching has disappeared in the last month. We did have Atka on a completely homemade diet and did not see any improvement, so we were getting quite frustrated. I tried a lot of experimenting, but I couldn’t seem to alleviate the itching. Interested in trying Wellness food for your dog? Click here for your $3 off coupon and shop PetSmart online! Does your pet eat grain-free recipes? Post a pic of you & your pet using #GrainFreeForMe! For the past few months, we’ve been having two issues: upset tummy and itchy skin. Mauja has had really inconsistent stools – some loose and some firm. We haven’t been able to find an exact correlation to her diet, but my first instinct tells me that’s the issue. Atka’s tummy has been fine, but boy has he been itchy. Atka has had itchy skin issues since he was about 10 months old. The first issue occurred around his eye. The area around his right eye became inflamed and the fur actually began to fall out. Thankfully, it never seemed to bother him. After Benadryl, several rounds of antibiotics, and a few types of ointments, it eventually went away. Unfortunately, after a few months it returned. The second time we didn’t pursue any medication because we couldn’t say that one approach was actually effective. He wasn’t itching or rubbing his eye, so after a discussion with the vet, we decided to simply monitor it for a few weeks. Eventually, it went away again. This seems to happen every few months. Currently, he’s not showing any symptoms with his eye, but his skin is quite itchy. We constantly see him scratching the back of his front legs and chewing on his back legs. Benadryl seems to help the symptoms, but it doesn’t get to the root cause of the issue. We’ve been experimenting with different proteins and a variety of high-quality foods, but we haven’t found one that improves either of their issues. After awhile, I began to seriously contemplate feeding them home-cooked meals. What should they be eating? How much protein? How many fruits and vegetables? How would they get all of their essential vitamins and minerals? How do I determine their macro-nutrient needs? After dancing around the idea for a few weeks, I remembered a product we were able to try at BlogPaws last year. The fluffies had received a sample of Dr. Harvey’s Veg-To-Bowl and absolutely loved it. Veg-To-Bowl is a grain-free premix of nine different vegetables and herbs. You simply add your choice of protein and oil to create a complete, well-rounded meal. It makes feeding your dog homed-cooked meals extremely simple. At least, that’s the way it sounds. I was still really nervous about making the switch to home-cooked meals, but thankfully, it was very easy to get my questions answered. After a phone call with Dr. Harvey himself, I felt much more at ease with my ability to adequately feed Mauja and Atka. I was really impressed that Dr. Harvey was so willing to take time out of his day to answer my long list of questions. Last week, we slowly began to transition Mauja and Atka to the Veg-To-Bowl food so today begins the first day of their journey. I’m really hoping that switching them to a fresh-food diet will solve the issues we’ve been having. After reading so many of the testimonials, I’m pretty confident we will see success. Each week, I’m going to write an update on their progress. Hopefully, these posts will assist any of you that have been considering making your dog his own meals. We also have a few other products from Dr. Harvey’s that we’ll be trying and telling you all about soon. Stay tuned for more of Mauja and Atka’s journey to home-cooked meals! 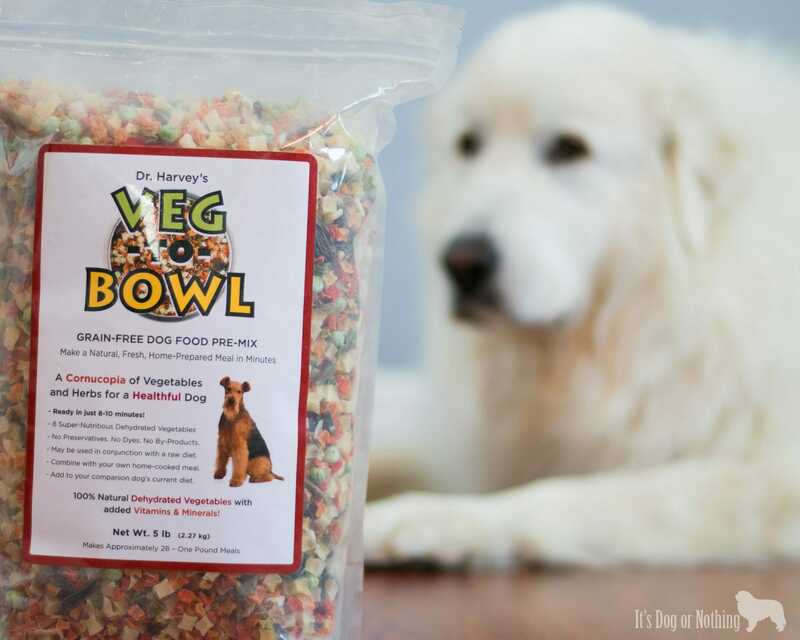 Disclaimer: Dr. Harvey’s provided Veg-To-Bowl in order for It’s Dog or Nothing to try home-cooked meals. Don’t worry – an advertiser will never influence the content of this blog. When I got married, I started on a mission to get my husband to purchase only ethically sourced animal products. He’s made some major changes to his purchasing habits over the last few years, which has made me feel a lot better. However, I knew I still needed to make a few more changes. I knew improvements were necessary for Mauja and Atka’s diets as well. I can carefully comb through the ingredient list and ensure the food made and sourced in the USA with high-quality ingredients, but that doesn’t usually tell me how the ingredients were acquired. In my opinion, that information is just as important as the ingredients themselves. 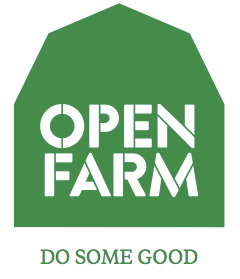 That’s why I was super excited to learn about the Open Farm brand. ensuring meat and poultry is 100% certified by the Humane Farm Animal Care Program. The HFAC standards ensure animals have ample space, shelter, and gentle handling as well as a healthy, antibiotic and hormone free diet. The animals are free to live how they would naturally. offering sustainable ocean caught fish that is free from antibiotics and artificial feeds. The fish are caught in a way that will cause minimal damage to marine habitats and other non-target fish and endangered species. mandating fresh and local fruit and vegetable sourcing. The manufacturing facility is regularly audited by the USDA, FDA, and AIB International to ensure maintenance of food and safety standards. Bag Recycling Program – Open Farm has partnered with TerraCycle to launch the first North American pet food bag recycling program. 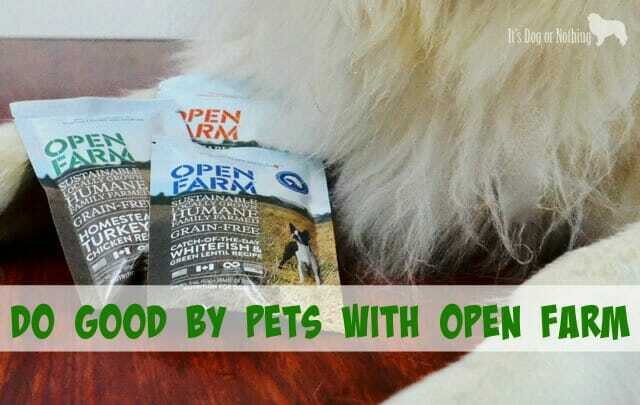 Since approximately 95% of pet food bags are not recyclable, Open Farm worked to create a better bag that can be recycled and turned into new products rather than sent to a landfill. Farming Standards – All partner farms must adhere to strict standards to help protect the water, air, and ground. Fishing Standards – Fishing methods that avoid overfishing help protect the aquatic environment. Local Sourcing – All fruits and vegetables are brought in locally to reduce fuel-heavy ground transportation. Feeding Open Farm to Mauja and Atka makes me feel like I’m doing good for them and the environment by giving them only the best possible ingredients. The only “complaint” I have is the size of the kibble. For most dogs, this won’t be a problem, but they are a bit small for giant breeds (they could definitely snort these up their noses!). Thankfully, Mauja and Atka are pretty good at chewing their food, so I don’t really worry with them. Want the chance to try Open Farm for your dog? Enter the giveaway below! If you just can’t wait, look for an Open Farm retailer near you or purchase here! For me, #TruLoveIs a Great Pyrenees. 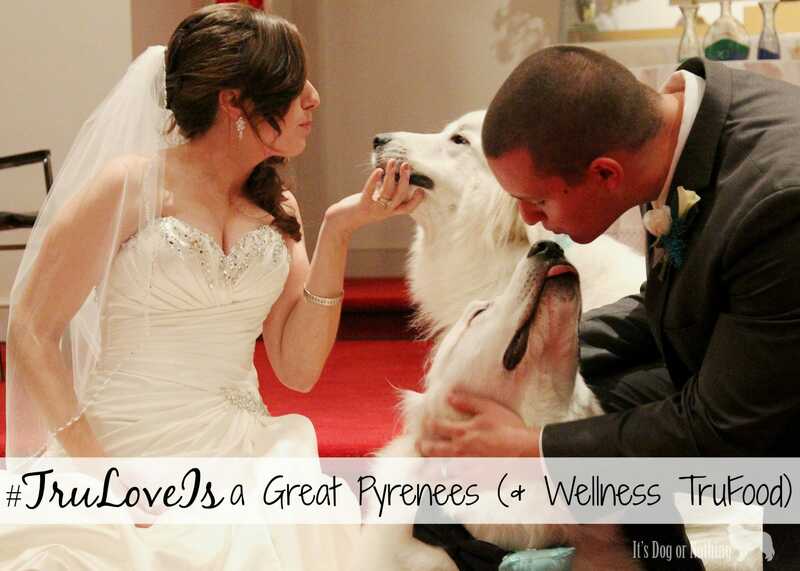 For Mauja and Atka, #TruLoveIs Wellness® TruFood®. As many of you know, Mauja and Atka are fed a rotational diet. I like to give them a variety in taste, texture, and nutrients. I don’t want to eat the same thing every day so why should they? Wellness has always been a staple in their rotation so I was thrilled when I found out about the new TruFood line! 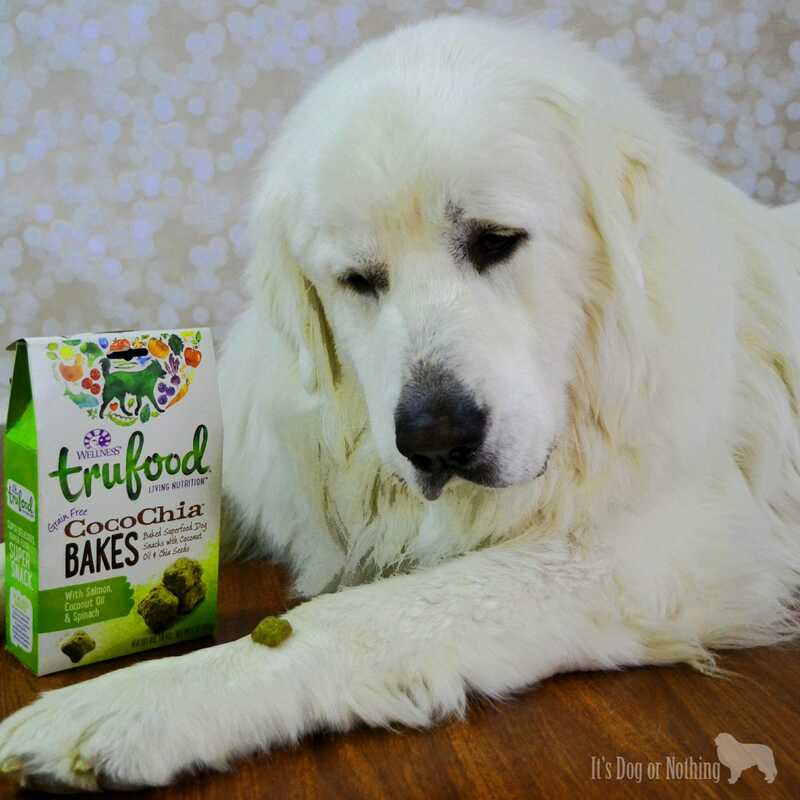 A few months ago, I wrote about TruFood and how it is baked rather than extruded (a very important difference which retains more natural vitamins and minerals) and how much the fluffies loved it. Wellness TruFood has more of what pets need to be vibrant and happy by using whole foods from farm, field, and sea. With 70% more raw protein than most other pet foods, your dog is getting more of the nutrients he actually needs. The whole-prey protein is complemented with kale, broccoli, green beans, and grain free fibers such as chickpeas, flaxseed, and lentils that are easier to digest. In order to support a healthy weight and immune system, TruFood includes powerful superfoods such as beets, blueberries, and cranberries. Digestive health is also enhanced with pumpkin, ginger, turmeric, and live yogurt cultures. Mauja and Atka can have sensitive tummies so I always appreciate when digestive health is a priority. There are several components to the TruFood line. Your dog (or cat!) can enjoy Baked Blends (dry food), Tasty Pairings (wet food), Coco Chia Bakes, and Protein Bites (treats). We haven’t tried the Protein Bites, but I’m thinking I need to add them to my treat list! So where can you get your paws on Wellness TruFood? Easy, you can find it at your local PetSmart®! PetSmart carries the full TruFood line. Dry food, wet food, and treats, you can find it all! Have I mentioned the Coco Chia Bakes? I’m always trying to give Mauja and Atka coconut oil and they just aren’t into it. The Coco Chia Bakes include coconut oil and the fluffies LOVE them! I think they look pretty tasty too (no, I haven’t tried them!). We all want to feed our pets the best nutrition we can and the natural, living nutrition of Wellness TruFood will help them live long, happy lives. So what are you waiting for?! Grab your pup and head to PetSmart to stock up on some TruFood deliciousness. Can’t make it out? Order it online here! Your pup will thank you. 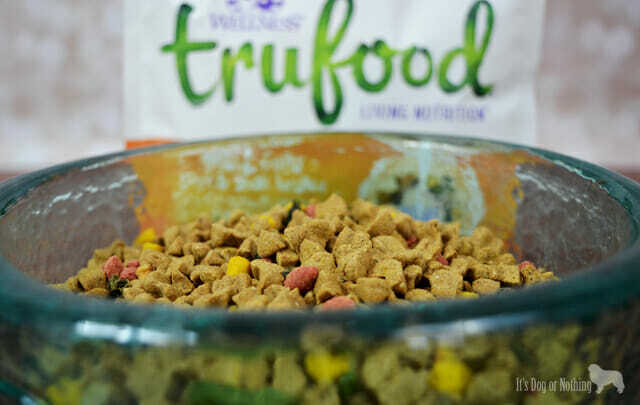 Has your dog tried Wellness TruFood? To keep up with PetSmart, follow them on Facebook, Twitter, Instagram, Pinterest, and YouTube!